The continuous influx of discoveries about the human body has further underlined the importance of prioritizing health. Along with the numerous medical advancements that help monitor and maintain health, one of the newest and most accurate ways of receiving in-depth knowledge about specific indicators of heath is by administering a CompID Scan using DEXA technology. 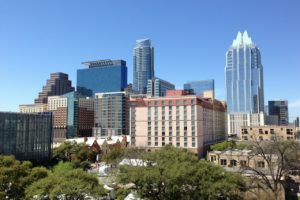 The health and fitness community in Houston, Texas, is flourishing, with several high-quality healthcare facilities, fitness studios, and access to outdoor activities, such as biking or hiking in Buffalo Bayou or one of the many city parks. As the healthcare industry in Houston continues to develop, Composition ID Houston is positioned perfectly to provide important data to health-minded clients through CompID scanning services. Read below to find out the benefits of a CompID scan, how it works, what information it provides, and where to get a scan in Houston. A CompID Scan using DEXA (DXA) technology provides a standard for measuring body composition and gives insight into other aspects of health. “DEXA,” which stands for “dual energy X-ray absorptiometry,” utilizes low-dose X-ray beams to determine the amount and distribution of body fat, lean mass, and bone mass. The machine consists of a flat bed with a moveable arm that scans the body from head to toe, distributing and measuring X-ray beam absorption through different parts of the body. An individual simply lies on a flat table while a bar passes over the top of the body. The scan itself takes approximately 10 minutes and there is no specific clothing requirement, except to remove metal jewelry or accessories from the body. Unlike an MRI or CT scan, there is no tube to lie in and results process instantly. 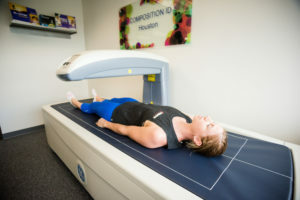 The scan provides personalized heath information that helps an individual better understanding their current state of health as it relates to percentage and distribution of body fat, muscle, visceral fat, and bone density. A technician then explains the data produced and answers any questions an individual may have. From there, clients can participate in the Nutrition Coaching program to help take steps towards achieving health goals and increasing overall well-being. What Does a CompID Scan Measure? This type of scan is a highly accurate method of assessing overall health and can inform risk of developing health problems in the future. By providing data on body fat, lean mass and bone health, it can help inform a nutrition plan, exercise routine, or other health interventions that can optimize wellness. A CompID scan using DEXA technology is the gold standard for assessing body composition. Unlike other testing methods, DEXA technology measures bone density with very little margin of error, which gives a sense of overall bone health and strength. The scan compares individual data to that of a healthy person in the same age group and demographic. A client is able to see how many standard deviations they are away from a T-score that is considered a healthy range of bone density. Typically, a T-score within one standard deviation away from zero lies within the healthy range of bone density, while a score that lies between -1 and 2.5 standard deviations away from zero may suggest reduced bone density and risk for osteoporosis. A T-score equal to or below -2.5 is classified as having osteoporosis. Body composition is a highly accurate measure of overall health. It provides detailed information about muscle mass, total body fat, and visceral fat. A CompID Scan is a helpful way to monitor body composition and inform nutrition and exercise plan progress by tracking muscle gain and fat loss over time. A CompID Scan not only provides an overview of body composition, but also a measurement of fat mass and lean mass distribution among specific parts of the body, including the arms, legs, trunk, android and gynoid regions. This allows an individual to learn of any imbalances or trending differences on either side of the body. 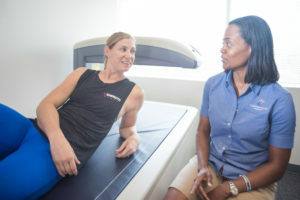 If any specific pain or weakness exists in one side of the body or among a specific muscle group, a CompID scan can help clarify concerns and determine a plan to address imbalances. If imbalances are not corrected, they may cause further health problems and pain in the future. Who is a Good Candidate for a CompID Scan? A CompID scan can be useful for any individual who is looking to learn more about their body, assess any health risks, and determine a strategy to get or remain healthy. While anyone can benefit from a scan, there are certain populations that would receive even more advantages from receiving personalized heath data. As the body ages, bones begin to break down. While common, decreases in bone density do not necessarily occur at the same rate for everyone. The risk of developing osteoporosis increases after age 50, especially if an individual has a family history of osteoporosis or has had previous issues with bone fractures. CompID Scans can also be beneficial for individuals who are trying to lose weight or those who have highly specific fitness goals. Data from a scan can show excess body fat on specific areas of the body, as well as muscle mass distribution. Detailed results about muscle and fat mass can help in form specialized programs for diet and exercise designed to specifically target and achieve personal fitness goals. Most importantly, a scan provides a measure of the amount of visceral fat, which if high, can lead to an increased risk of diabetes, heart disease, and other serious conditions. Where Can I Get a CompID Scan? DEXA technology is still a new and highly technological offering, so it is not yet widely available. However, Composition ID Houston offers this technology and is conveniently located in the heart of Houston’s vibrant Upper Kirby district, just a short distance away from the Houston Galleria, Museum District, and downtown Houston. If you are interested in getting a CompID Scan in Houston, call, schedule online, or visit the Composition ID Houston office.